If you have been reading this blog for awhile, you know that I like sauces. But not the kind that take all day and a ton of skill. More like sauces or condiments that are easy to make and pack some serious flavor. 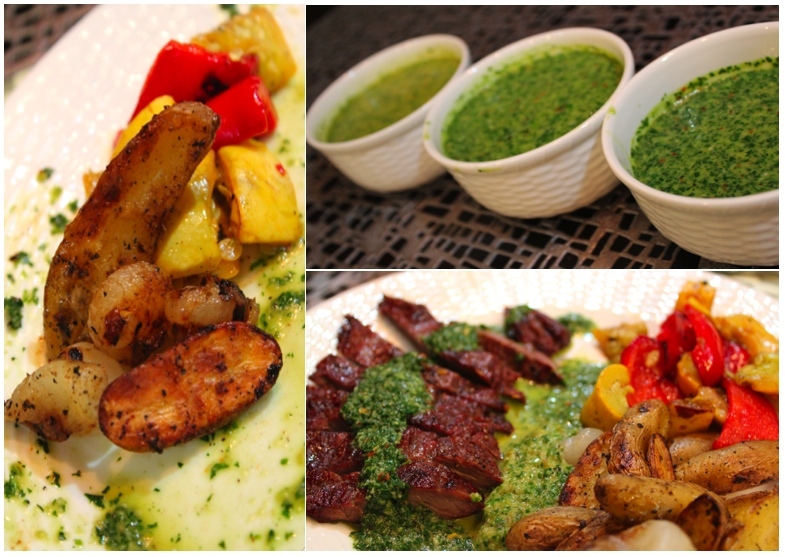 Chimichurri is like ketchup in some South American countries. It is the perfect accompaniment to grilled meats of any variety and is fantastic swirled into rice or drizzled on grilled vegetables. I happen to love the classic style of this sauce, but I wanted to experiment with some different flavors. I took the classic recipe and replaced cilantro for parsley in one, and in the other I added spicy gardinera. If you like spice, the gardinera chimichurri was fantastic. It is spicy, salty, and fresh. My obsession with cilantro makes the other variety perfect for me as a summer staple I can top anything I take off the grill with. To make this dinner a bit more interesting, I wanted to try grilling potatoes. If you do not have a vegetable basket for your grill (I highly recommend one), then you can use foil instead. The cipollini onions are so tender and sweet with the rustic potatoes that I could not help plucking all of them out of the basket before they were even off the fire. Tip: Like I have been saying in other posts, as long as you are grilling you should make more for leftovers. Whether you grill steak or chicken, make double and turn the leftover protein into a salad or sandwiches the next day. To make each sauce, simply put the ingredients for that particular chimichurri in a blender, food processor, or mini-chopper and blend until all the ingredients are chopped up and combined well. If you feel the consistency is too thick, add some water. Taste and adjust for seasoning. Repeat with each sauce. Grill your favorite meat, such as skirt steak or chicken breasts with some salt and pepper. Serve with sauce for dipping. You can also grill cut up yellow zucchini and red bell peppers and top with this sauce as I did above. In a large pot of salted water, cook the potatoes until just cooked through, about 10 minutes. Remove potatoes from water and place in the fridge. Add in the onions to the same water with the skins on. Cook for 10 minutes or until just tender. Drain and cool in fridge until able to handle. Using a small paring knife, cut the bottom off each onion and slip the skin off, keeping the inside of the onion in tact. Place in a bowl with the potatoes. Toss all the vegetables with olive oil to coat and salt and pepper to taste. Preheat grill to hot and place a vegetable basket on top if grates are too far apart to hold the vegetables. (you can use foil as well). Grill until potatoes and onions are tender, but not falling apart, have great color and taste yummy. About 10-15 minutes. Serve with chimichurri on the side.